This note will help you to move your app icon to the top position on your fan page, change the order of your apps, change your app image or help if adding the app back to your app line. - Go to your Facebook Fan Page and click on the "More" drop down box below the main cover image. Click the option to "Manage Tabs." Your apps show up in text just below the main cover image (look for "ShopTab Store" below) and on the left rail of the page. Drag the apps into the order you desire for your page. We like to place the Shop as your first option. At the top of the Fan Page click on the "Settings" option. Select the "Apps" option on the right rail. Click to "Edit Settings" for the app as noted below. Click to Change the tab image. Hover your mouse over the image and click the "Edit" to make your changes. You'll need a 111 pixel by 74 pixel wide image. We've provide three images you may want to use below. You may change the text under the icon as well. - Go to your Facebook Fan page where you have assigned the app. - Click on "Settings" option. - Then click on "Apps" on the left rail. - Then look for the ShopTab icon listed on this page. 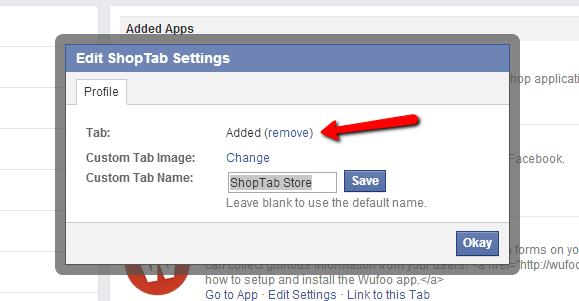 If you find it, click on "Edit Settings" and then "add" it back to the page. Go to your Fan Page to see the icon on the page. NOTE: the app icon may not show on the page since it could be low on the list of apps. See question #1 above to find the app and move it to the top text option below the cover image and on the left rail apps position. - Log into ShopTab Admin. - Click on "Settings" and the "Add to Facebook Page"
- If your app is assigned to a page it should show it is connected. Click on the "Remove" button. - Once it is removed, click on the "Connect" button to add it back . - Check to see if it is on your Fan Page.